Texter is a text-substitution app thats sits in the system tray and replaces user-definable abbreviations with commonly-used phrases in any application. You can also set return-to markers for your cursor, insert clipboard contents into your replacement text, or create advanced keyboard macros. Great for frequently used phrases, email signatures, or words with great length such as medical or biological terms. How to extract: Download texter.exe to a folder of your choice and launch. The help links in Texter do not work and returns 404. No explanation of the features, and thus most of the features are useless since not documented. I find Texter more practical and intuitive than TyperTask but I'm having some Keyboard key combinations to be in conflict with other Applications (eg Ph0t0sh0p) and Win10 global shortcuts (eg Win+I) so I have to constantly disable it as a workaround to it. TyperTask on the other hand is more "TEXT-ONLY" configurable but I get NO CONFLICTS at all. Pity. can't find the server at svn.adampash.com. @I am Baas - That was a link to the local installer. 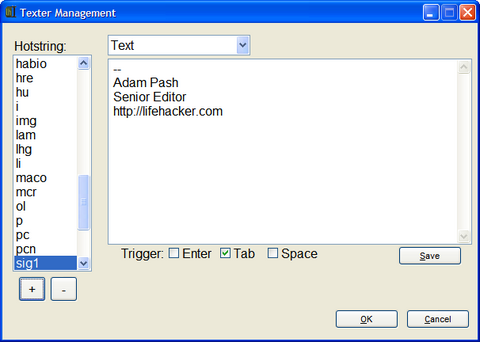 The plain texter.exe you need isn't hosted on lifehacker.com anymore so I switched it to Adam's repository which should work fine. I agreee with Nick's comments. I don't have Mark's problem because I use it on phrases i have to use over and over and I give them a name like COD2 that can't possibly be mistaken for a word. Despite its problems, this program exactly meets my needs and I haven't found any other free program like it. I use this on a regular basis at work. However, the replace has a major bug. If you type "larg" it will add the e on the end immediately, as if you're mistyped it. Then, when you put the e on the end, it will see the "largee" and change it to larger. So, I disable that. Worked on XP for me. SP2 and now SP3. Also has some deal with making hundreds of strange files that do nothing. Flawed, but lighter than the other auto programs. It does run under XP but the replacement doesn't work. it wont run under windows vista .... only the first start is ok but after closing the app and restarting it wont start.